Why a decade of research? The overriding purpose of my 10-year long research has been to provide annual checkpoints for people involved in digital transformation of organizations. Each yearly report since 2006 has highlighted both status points and challenges on the digital journey. This evidence-based, multi-year narrative has helped many organizations understand where they are and what they want to achieve. Deep changes are taking place in organizations today. Their very nature and shape are evolving. People are at the heart of these changes. They are working in networks and communities; they are living in work cultures that challenge many traditional management methods; new forms of leadership are emerging. The Foundational Framework, defined in 2013, brings the human dimension of transformation to the forefront and has been used by many organizations for triggering meaningful conversations and developing strategies. The survey itself is used as a diagnostic tool by many participating organizations. Jon Husband, digital pioneer and creator of Wirearchy, a revolutionary concept that challenges traditional ideas of what organizations are or could be. Harold Jarche, knowledge management expert and creator of PKM, the Personal Knowledge Management concept and method. “Jane is doing very solid and interesting work in an arena that needs constant attention. 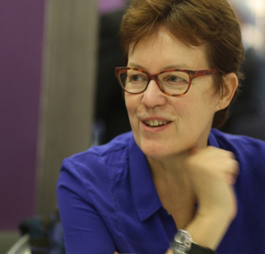 “Jane McConnell is considered one of the pioneers of the digital workplace. Like DWG, she has helped to popularize the term and associated concepts, which are now also being picked up by organizations like Gartner. Her trend report series has been running for 9 years now and … (today)… is pitched much more at senior management in looking at organizational and enterprise-level digital trends, although it will be of equal interest to practitioners who need to be influencers and even change agents relating to this subject.” Full review. “The most symptomatic evidence of the evolution of the concept of intranets is obviously the much awaited study published by Jane McConnell every year. 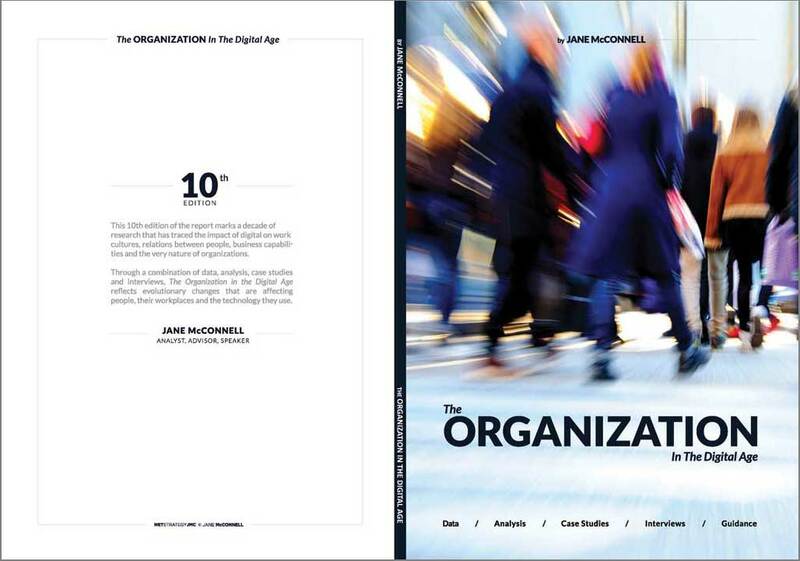 The ninth edition was issued a few months ago and everyone should take two minutes to think about the deep meaning of its title : Organization in a Digital Age. Even if the subject is still the same, what I’d call the digital work environment, the evolution of the title is meaningful. The very first editions were mainly about intranets, then came the word “digital workplace”, and this year there is no mention of any tool : it’s about organization. Understanding the reasons and the meaning of this change of perspective while the study is still about the same matter should be a mandatory work for anyone leading an intranet projet in order to take things by the right end. Among the most interesting points of the study I’d mention the strong correlation established between customer relationship and digital workplace. That’s really something worth thinking about while everyone is rushing into digital transformation from a customer perspective while overlooking the internal side.” Full review. “The eighth edition of the Digital Workplace Trends report by Jane McConnell represents a long leap forward in trying to quantitatively and analytically paint the direction towards the Connected Organization through a Digital Workplace Scorecard.” Read full article. “From a variety of sources and my examination of what large enterprises are planning for this year — including the wonderful new report “The Digital Workplace in the Connected Organization in 2014″ by workplace technology guru and industry colleague Jane McConnell, we see these significant new workplace/tech factors as moving into focus within organizations this year…”. Read full article. “Jane McConnell, Netstrategy/JMC, has recently published her excellent annual report, The Digital Workplace in the Connected Organization….I highly recommend this document to who wants to stay competitive in today’s market and who desires to attract and retain an intelligent workforce.” Read part one full review. Part two. Jane’s report, ‘Digital Workplace in the connected organization’, is the most comprehensive report about the digital workplace. It’s her 8th report and it again contains loads of information and interesting insights. As I’ve said before: It’s a must-have for every person interested in or working the intranet, digital workplace and social business space. By the way, Jane regularly shares insightful nuggets from her research and extensive experience over on her blog. Review here. “There are a small number of people in any area of endeavor who become recognized as builders of fundamental frameworks that stand the test of time and become the accepted way of managing complex problems. Notable examples include John Zachman for enterprise information architecture, Edgar Codd for relational databases and Murray Gell-Mann for elementary particles. Jane McConnell, of NetStrategy/JMC, deserves to be added to that list for her work on digital workplaces…….No matter where you are on your digital workplace journey, and even if you have not yet started, this report will provide an agenda for discussion and action over the coming year that could transform your organization and with it your career.” Full review.